note the bird-like shape with the head pointed down and to the right. 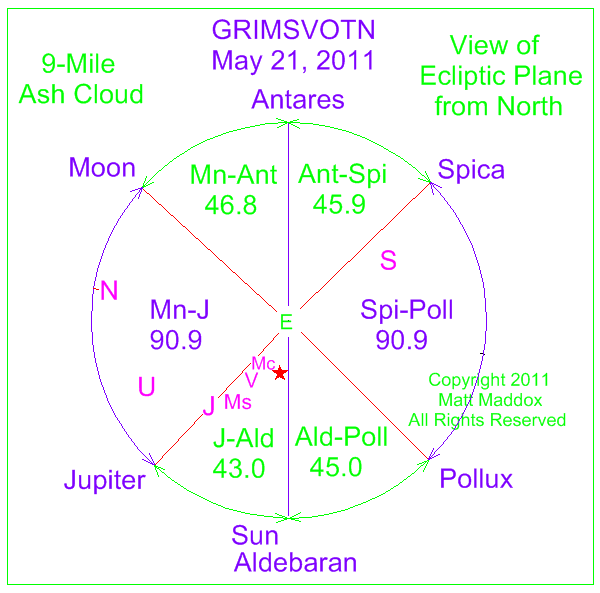 this is a pentad - group of five symmetric axes - composed of seven bodies: sun, moon, pollux, venus, mars, saturn and uranus. 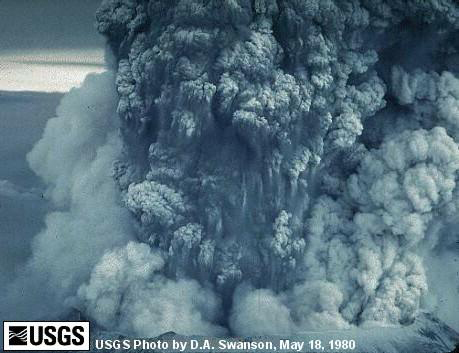 it's interesting that such a qualitative and quantitative pattern should be associated with a large eruption. that association helps to establish cause and effect. 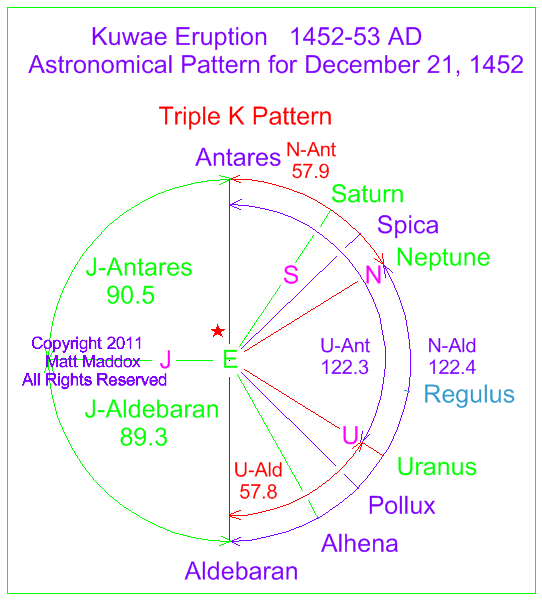 note the reinforced k pattern with jupiter-pollux and saturn-aldebaran alignments. the uranus/regulus subpattern makes this roughly a double-k pattern. 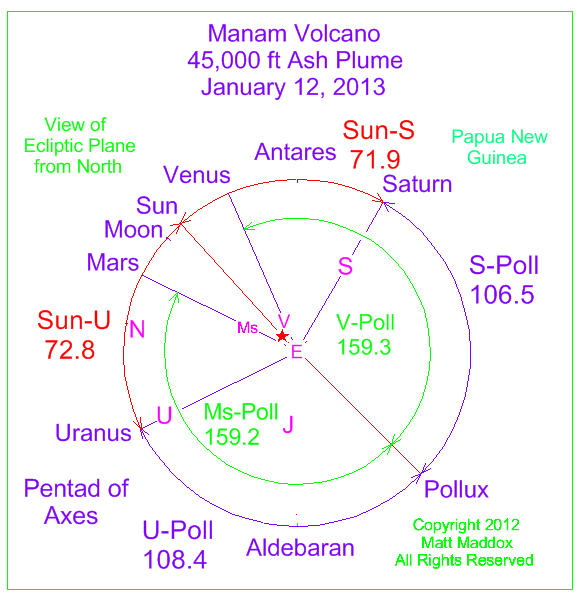 in addition, uranus and neptune exhibit a precise angular match with pollux at 61.0 degrees each. this long-term large planet symmetry with pollux enhances the pre-existent k symmetry. 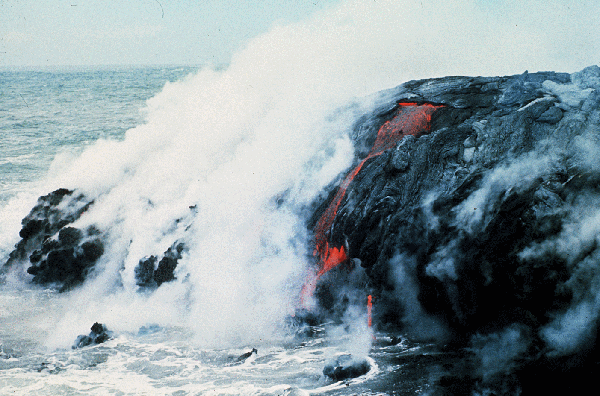 note the moon-planet-star symmetric subpattern in place at the exact moment of eruption. also, please note the small planet alignment composed of mercury, venus and mars. this small-planet axis was actually part of two different symmetric tetrads. 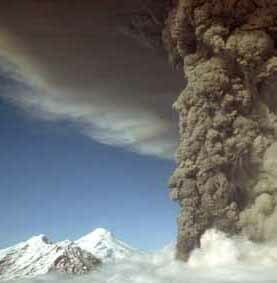 and the resultant ash cloud stranded thousands of passengers worldwide for several days. thousands of flights were cancelled and travel & shipments were severely disrupted in europe. 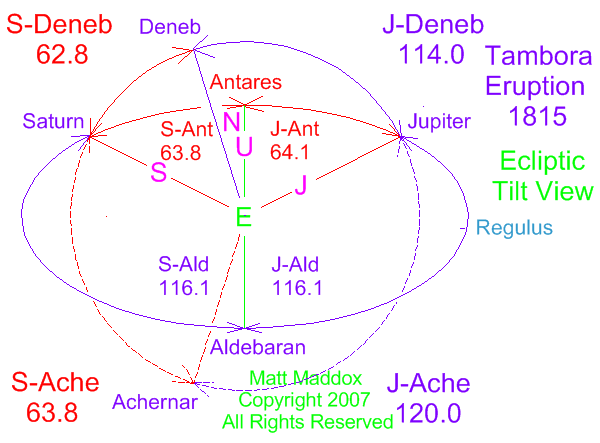 note the symmetric subpattern composed of jupiter, neptune and regulus with the ecliptic k pattern made up of antares, aldebaran, spica and pollux. 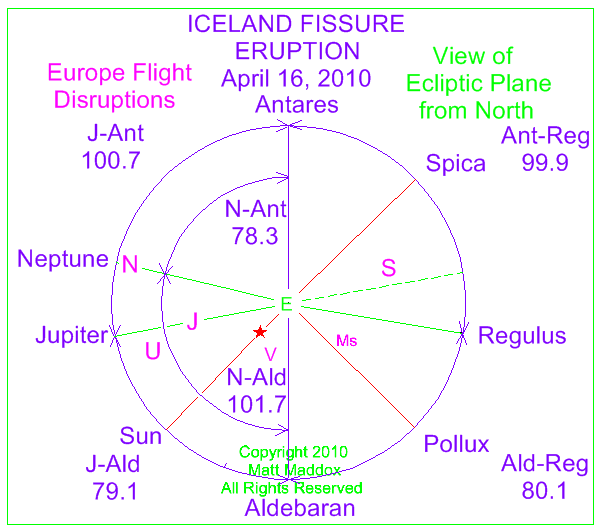 also, the sun is at an annual position which sets up multiples of 45 degree angles with the k.
saturn is opposite uranus - this was also the case with the major eruption of grimsvotn in iceland in 1783.
the mass stranding could well have been an electromagnetic disturbance (emd) event. event, but an emd event is a distinct possibility for this accident. the fedex md-11 accident was reported as a possible wind shear event with gusts up to about 50 mph. 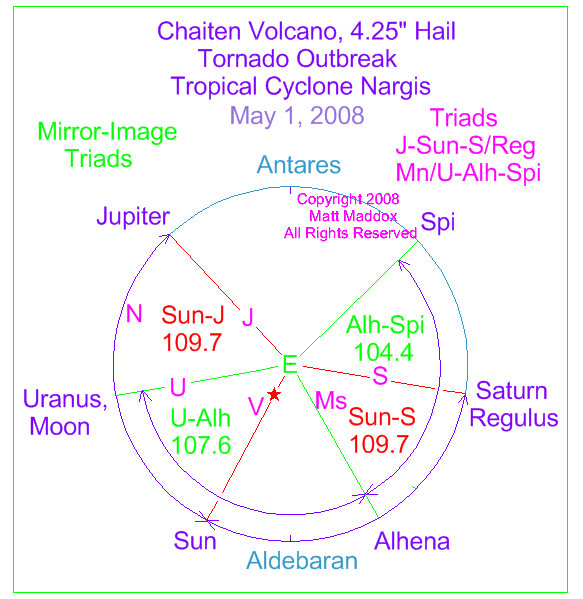 the sun-jupiter and sun-saturn angles for the chaiten eruption were exact matches - 109.7 degrees each! 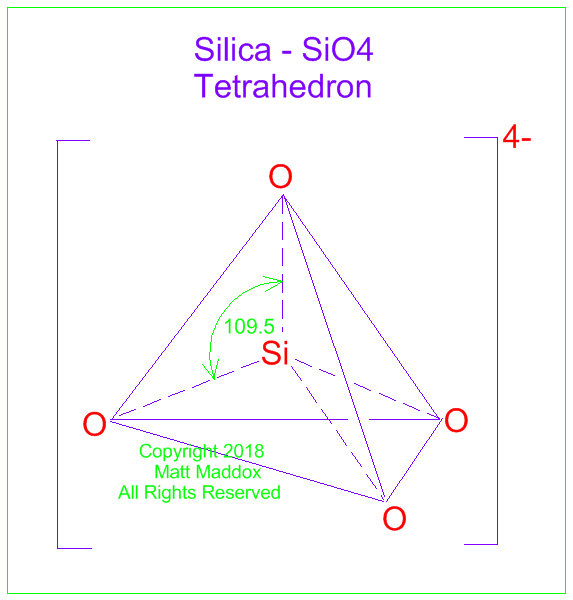 this just happens to match the bond angles for the silica molecule which is the main ingredient for many rocks in the earth's crust. 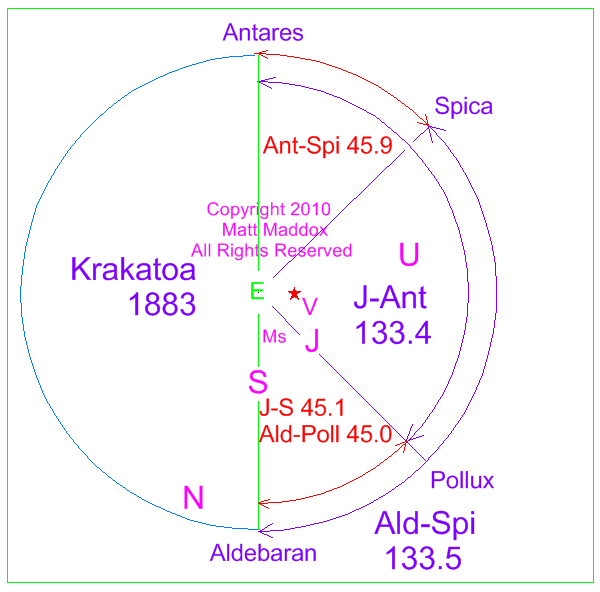 it also happens that both the jupiter-hadar and jupiter-achernar angles for krakatoa in 1883 were exactly 109.6! gravitational energy from these bodies were working either dierectly or indirectly to agitate the silica molecules resulting in massive eruptions. please see electromagnetic field disturbance model diagram under power outage for an explanation of the cause of volcanoes and tornadoes. 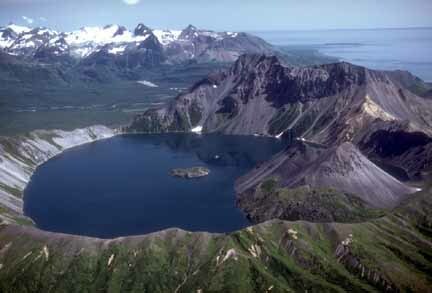 it is probable that both gravitational and electromagnetic disturbances are the cause of volcanoes. 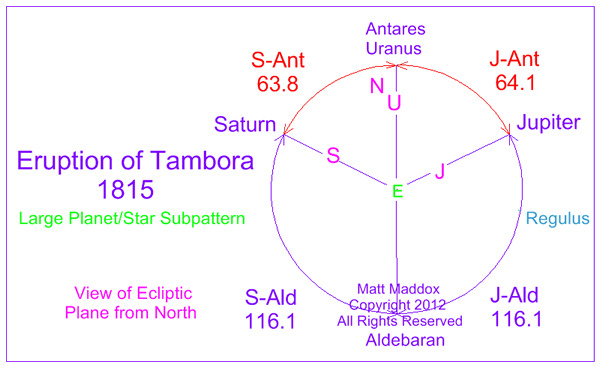 saturn, uranus and jupiter complete a strikingly symmetric pattern with two ecliptic stars at the time of the explosive 1815 tambora volcanic eruption! 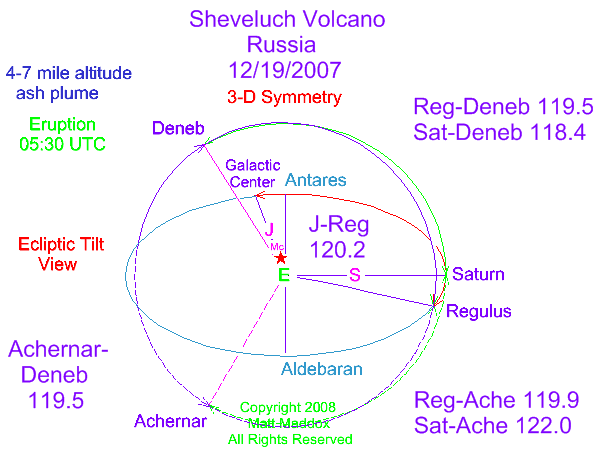 there are two very powerful stars outside the sun-earth or ecliptic plane - achernar in the southern hemisphere and deneb in the north. when angular separations with these two stars are considered, the approximate 64/116 pattern is reinforced! 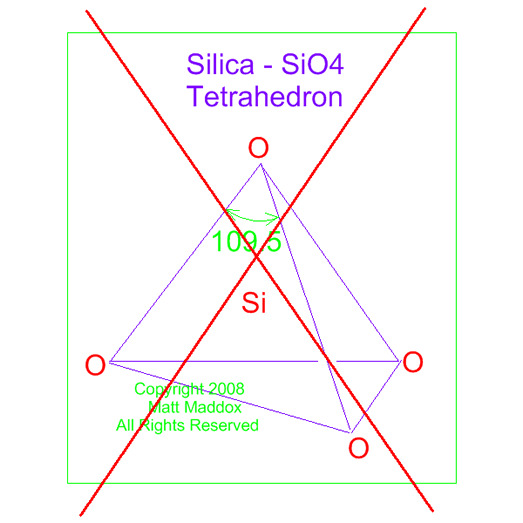 both jupiter and saturn are at positions which could be considered "three dimensional symmetry points!" please compare this 3d diagram with tambora 3d just above. also, compare with venus heat flow anomaly of march 22, 2008. finally, check out shuttle columbia 3d diagram for 3-dimensional symmetry! 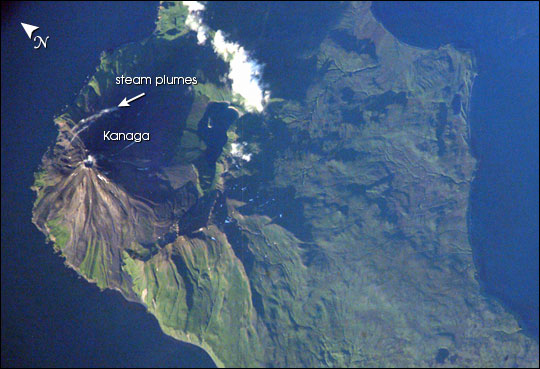 in late 1452 or early 1453 ad, a spectacular eruption occurred in the vanuatu islands of the south pacific, north of new zealand. in volume of total vented material, it probably surpassed the tambora cataclysm of 1815! 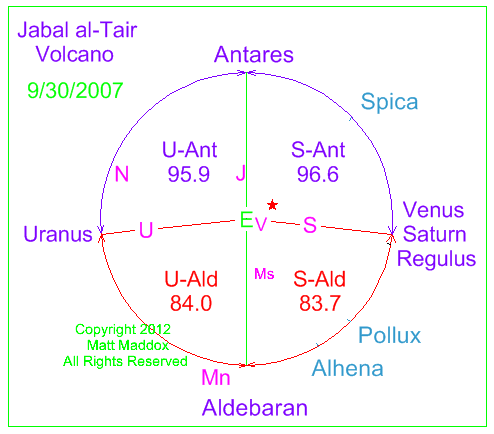 for this episode in volcanic history, please note the angular similarity of uranus and neptune with the antares-aldebaran backbone of the “k” structure. at matching angles of approximately 58 and 122 degrees, this pattern would have persisted for months, allowing energy from earth’s core and mantle to be funneled to the same spot in the earth’s crust- a volcano named kuwae. saturn, moving through the sky at about one degree per month, would have stayed in this mirror-image position for several months. in fact, the february 2, 1453 position shows an exact match for angle values- 148.6! 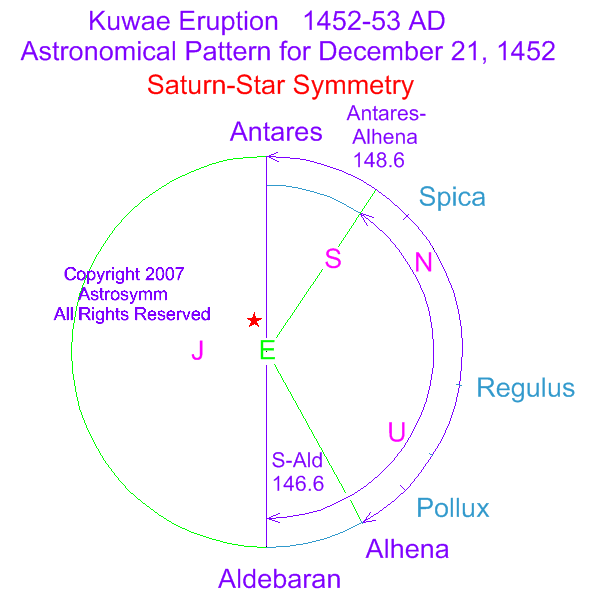 furthermore, jupiter is very close to exhibiting right angles with the backbone during this late december period. 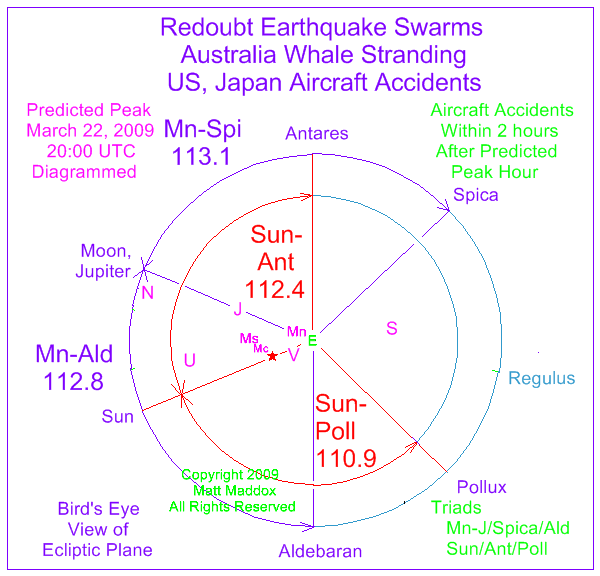 <<disclaimer regarding historical patterns>> astronomy software uses mathematical formulas which can show incremental drift for historical dates. the moon and small planets are not shown due to the large numbers of cycles involved going back 5 ½ centuries. here are the approximate number of cycles for the large planets starting at the year 2000 and going back to 1453: jupiter- 46, saturn- 19, uranus- 6.5 and neptune- 3.3.
therefore, since the number of cycles is relatively small for saturn, uranus and neptune, these values are dependable. the jupiter position should be accurate also. 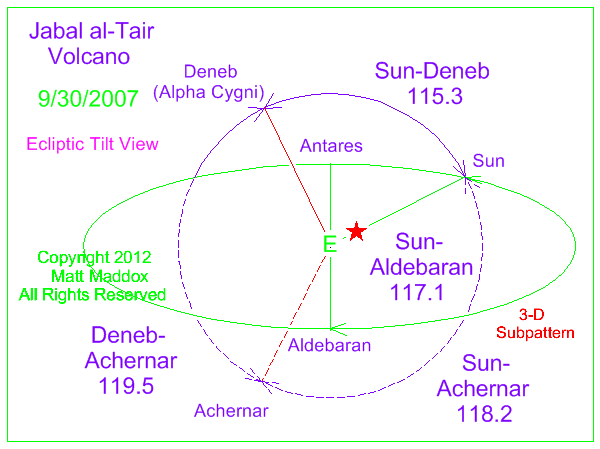 the sun-aldebaran angle of 117.1 within the sun-earth plane on the day of the eruption matches the sun-star and star-star angles outside the plane. please note that the sun on september 30 is in the same position as jupiter for the massive tambora eruption in 1815 (see below). 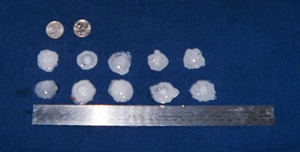 for other 3-d patterns see tropical storms and earthquakes. don't miss the repeat pattern for the 1906 and 1989 san francisco earthquakes! 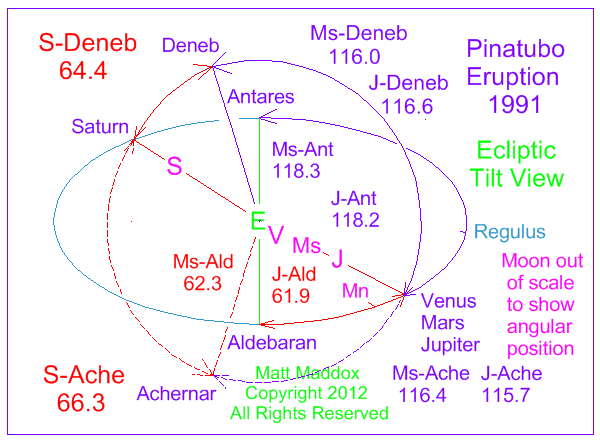 note the unmistakeable symmetric pattern of planets saturn and uranus with the ecliptic stars antares and aldebaran! 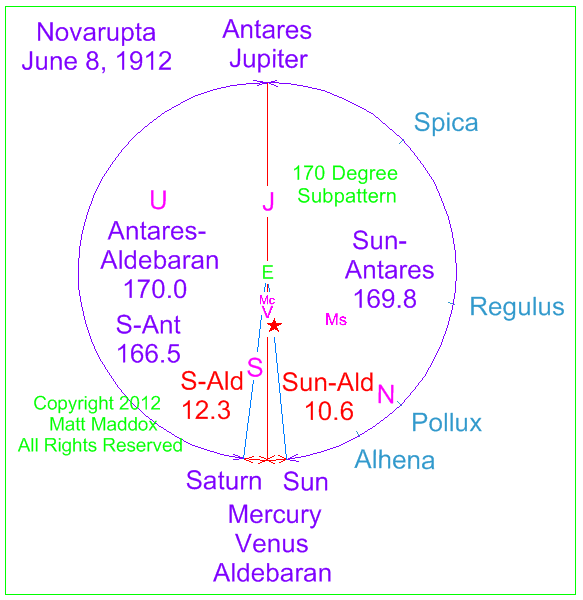 the saturn-aldebaran and uranus-aldebaran angles were each exactly 84.0 degrees! the sinkhole in san diego, california developed later on the same day, october 3, 2007.
the volcano erupted exactly in the middle of the predictive window of 9/30/2007 plus or minus three days! 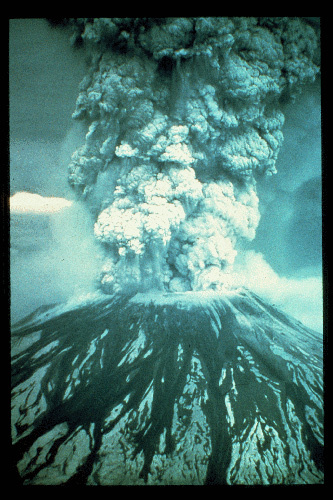 on may 18, 1980, mt st helens volcano in the state of washington unleashed an incredible explosion that took the tops off trees miles away. 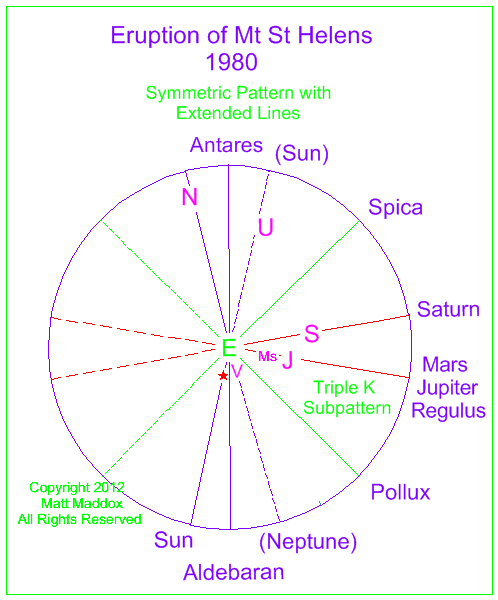 saturn was opposite a formidable alignment of mars, jupiter and regulus, completing a “v inside k pattern”. the sun was opposite neptune, forming a “shallow reverse k”. 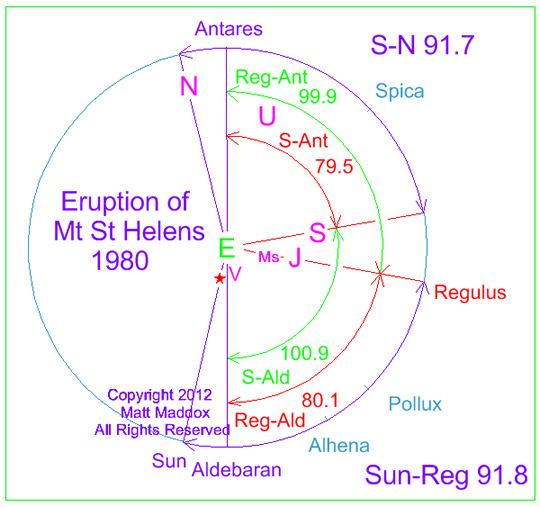 and the saturn-neptune angular separation of 91.7 degrees almost exactly equaled the sun-regulus angle of 91.8.
so the whole earth, including the molten core, was experiencing a very structured combination of gravitational fields converging on it from different directions. the extended, or extrapolated, lines in the second diagram emphasize the permeating effect which the gravitational fields exert on the earth- in most cases the fields probably reach through the whole of the earth’s mass. 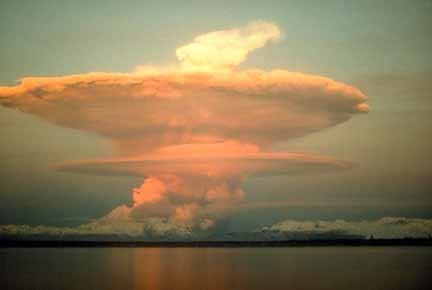 this major eruption occurred in alaska over 3 days from june 6-8, 1912. during this time venus and jupiter were aligned along the antares-aldebaran axis and the sun and saturn were symmetrically offset from the stellar axis about 9-12 degrees each!